The black d:fine Core 4266 Slim Omnidirectional Flex Headset Mic, 90mm Boom with MicroDot from DPA combines the sound of the d:fine 4066 omnidirectional capsule and Core amplifier in a lightweight and flexible two-ear headset. 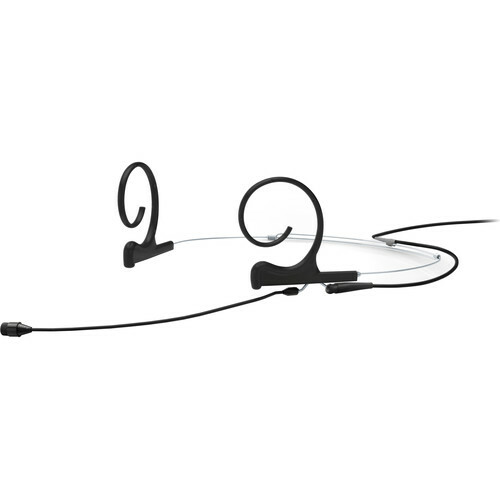 It can be used when talent needs to be mic'd quickly and easily, and it's lightweight, comfortable design means the person wearing the microphone will barely notice its presence, making it well suited to conference, speech, and active live-performance applications. The omnidirectional polar-patterned Core 4266 offers a 14 dB decrease in total harmonic distortion and a 4 dB increase in dynamic range over the Legacy version. The mic is ergonomically designed to fit comfortably; it easily adjusts to fit any ear size and head shape, while at the same time, it mounts securely and is hardly visible. By rotating the boom and the ear hook, the microphone can be used on either the left or the right ear. In addition, the connector splits the cable from the microphone boom, allowing you to swap broken cables and/or wireless connectors quickly. The boom arm is also interchangeable and three windscreens are included. Box Dimensions (LxWxH) 9.15 x 5.65 x 1.55"